It is a semi lost area in the Nevada desert, USA. A group of men is getting ready to train with Uzi submachine guns. Right there, an hour away from Las Vegas, these people have developed something like a university of firearms where the philosophy is ";in a gunfight, it is better to give than to receive"; and where the subjects are ";Defensive Handgun"; or ";Practical Rifle ";, as an example. 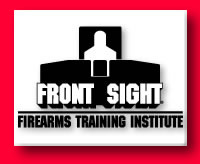 ";Don';t worry; you don';t need to have previous experience at Front Sight Firearms Training Institute. I have in my hands an Uzi submachine worth $3,500 with 25 cartridges in the magazine. I have to hit my targets' thoracic cavity with 3 of them and then hit it in the head with two more, just in case. This is not an action movie script, neither is it for "Nintendo 64". This is about a real Friday morning in the middle of May, in a development near Las Vegas. This development is called Front Sight. Prior to being trained, you have to sign a document, where basically, the person ensures that he/she has never been convicted of a felony nor taken prohibited substances, such as drugs and alcohol. A signed statement of a friend or relative of the applicant that has known him for at least five years accompanies this declaration. This is the suitability that the instructors at Front Sight ask for. My application was "sponsored" by the editor of this magazine and sent to Front Sight via fax from Santiago a week before my arrival. As a reply and confirmation, Front Sight sends back a map with directions to its site and a list of hotels in Las Vegas where students spend the night. Ignatius Piazza is one of the few men in the world that has the title of Master of Four Combat Firearms, and is the brain behind Front Sight. 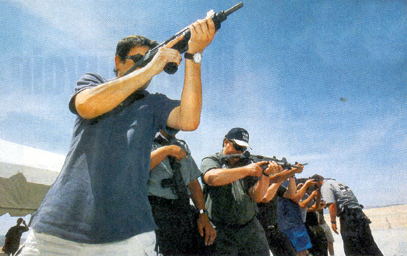 In the United States, there are over 192 million firearms in the hands of civilians, and Front Sight is not the only place where people are taught how to use them. But it is most likely the most original -if I am allowed to use this word. The idea is to turn these 222 dry hectares into a kind of resort where instead of having golf courses and a swimming pool, you have shooting stands and a martial arts gymnasium. That is not all. In the planning stage is a housing project where aficionados can build their own houses on the premises. There will be a school, an air strip and even a private shooting range for Hollywood celebrities and famous executives who want to unload their firearms anonymously; in other words, without dealing with the press headaches afterwards and be judged as politically incorrect individuals. To make all this possible, Front Sight has launched a promotional campaign whose selling tool is a free sub-machines training day. It is precisely this promotion that has me here on a Friday morning in the middle of May, with a Uzi worth $3,500 in my hands. We are sixteen students in total, divided in two groups of eight. To my right, in the line of fire, there is an individual whose hand shaking is visible. A few minutes ago, he looked like a Pro. He was wearing Smith & Wesson shooting glasses and asked good questions. Now, with 25 cartridges in the magazine, his mental presence has left for Las Vegas. I can see him with the side of my eyes since I am supposed to be concentrating on shattering my target's lungs. I can't stop thinking that it is possible that my neighbor may go into a crisis, turn around fire on me. If he were to fire on me, he could injure me as well as the students. Anyone in the line of fire can do it. I could too. 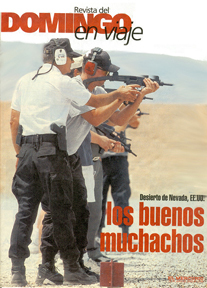 With the Nevada desert behind, the instructions are given by professionals: you have to learn to shoot someone and not something. Fortunately, I stop thinking about that because one of the instructors gives the order to fire, until calm desert wind turns into a loud sound of shells with the clouds of smoking guns. I clench my teeth and pull the trigger. I hit the target, a paper rectangle with the human body figure imprinted, 3 in the chest and 2 in the head. The class starts at 8:30 in the morning, with a brief chat from the brain of Front Sight, Ignatius Piazza, under a large white tent with air conditioning and a table filled with hors d'oeuvres and drinks, courtesy of Front Sight. Piazza used to be a chiropractor that respected the law and a firearms aficionado that was in the middle of a random street shooting in 1988. During that shooting, he realized that, besides all the training he had, he was not able to use all of his arms potential to defend people. If I come out of this one, he promised himself, I will train myself to the maximum. Five years later, he became the second man in the world with the title Master of Four Combat Firearms, something similar to Black Belt in bullets. Shortly after that, he opened Front Sight in an abandoned military base in California. 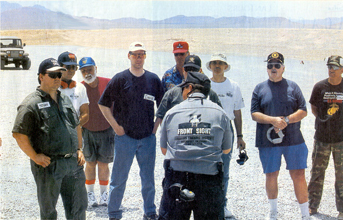 He was there until 1998, when he transferred his operation to his new settlement in Nevada. Piazza - or Doctor Piazza, the way his subordinates call him - keeps his audience of sixteen students hypnotized. He tells them that we, ourselves, are the firearms, the rifle or the gun are tools only. Times are tough. We need to work hard to change the reputation of people who carry guns. "In the 60's - he explains - Harley Davidson motorcycles were looked down upon because they were driven by gang members. But the management of that company launched a marketing campaign and then the motorcycles started to appear in the movies, linked to movie stars and multi-millionaire executives and that bad image disappeared. We want to do the same here". We have here a reporter from Chile that has come here to take the course. What is your name? Ok, tell these people what was the agreement we made, so that you could come here and write your article. Agreement? I only agreed to write what I see. That is right, you will take the course and will write what you see and if we don't like what you write, well, then don't come to Front Sight anymore. He said it in a teasing tone, in fact, everyone is laughing, I can't stop thinking that Dr. Piazza has a nine millimeter gun on his hip and I only have a pencil, a notebook, and two stupid pieces of white tape with my name on them, attached to my chest and the other one in my back. I read the names in the hats of the other students: Mike, Adam, Doug, Bill, Jim, Bryan, Dave, Kristie (the only woman, a sweet face and 18 years of age). There are retirees from Las Vegas, attorneys from Salt Lake City, students from New York, financial experts from Seattle. For example, Bill and Jim are friends and use the same olive green color uniform. They are joking and laughing with emotion. This is a picnic to them. They are anxious to fire the Uzi. Instead, I only have experience with an air pellet rifle that was given to me at Christmas a long time ago. I sure don't seem as excited. Piazza plays with the tension and maintains that hypnotic atmosphere for a few minutes longer. He explains what the Front Sight town looks like. He also reminds the students that are taking the free course to enroll in the fee based ones, which are between $500 and $1,500 and last from two to four days. When he is finally finished, he invites us to the complex. Students feed off bucket filled with bullets. The course is free, but it is financed thanks to the paid ones at Front Sight and can cost up to $2,000. Almost everyone returns for more. We practice for a long while with empty chambers. We make sure there are no lost bullets in the chamber of the sub-machine, always putting the index finger pointing towards the front and have it in the trigger, removing the safety button. We then have to do the same but backwards: activating the safety button, removing the chamber, and reviewing the chamber. It is worth mentioning that the three class instructors (Doctor Piazza only participated in the beginning of the training session) are real professionals. They know what they do and know how to teach. They do believe they are saving your life with all of this training. One of them, Jim Gass, a thin gentleman in his 50's, seemed to favor me. Every time I do something correctly, he becomes excited, he taps me on the shoulder and says "muy bueno amigo". With constant repetitions, the atmosphere loosens up. Bill and Jim have been somewhere else. They are talking about a couple of women they met in Las Vegas and will meet together that night. The rest of the students are more concentrated. In general, this is about people who have been robbed, assaulted at home or in their businesses and that have decided to take firearms in their hands. 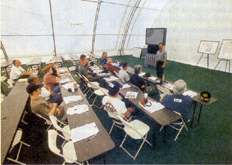 Consequently, the class focuses in that direction. In Front Sight you never talk about shooting at something but rather, shooting at someone. For example, it is explained that you don't gain anything by shooting an individual in a non vital point, because that individual is, by habit, under the influence of drugs or with high levels of adrenaline in his/her body, so a wound in his/her legs will not end his/her bad intentions. That is why one should aim at the chest, and if the individual is still standing, aim at the head. No mercy. The property and the family are up in the air. The author of this article holding in his hands an Uzi worth $3,500. The guy with the Smith & Wesson sun glasses who was shaking by my side is now more relaxed. Bill and Jim are extremely happy, although I have to admit that I have a better aim than they do. Kristie, the only woman in the group who came with her father from St. Louis, is doing quite well. Dr. Piazza passes by the practice area periodically to find out how everything is going. Things are in order. The class is coming to its end and there is a test coming up. 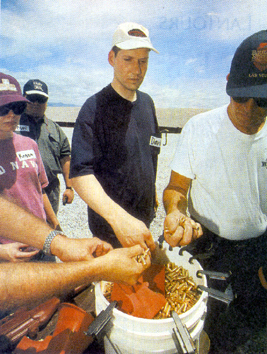 It consists of emptying a magazine with 25 cartridges without missing the thorax box in the target. It can be accomplished if you learn how to stand correctly and properly handle recoil. We all have to take the test at the same time. The order is given and the bullets fly away. To shoot here is not like in the movies. I mean by this, the sound is not stereo and it does not have surround sound. It is a dry sound, as if it came out from a small speaker. The holes in the paper in front of the group are real. Even though the targets are close, not everyone gets all of their hits in the thorax. As I approach to remove my target from the stand, Jim Gass and the other instructors shake my hand firmly. The group returns to the large white tent for the final chat. In it, Piazza insists that today's class was just a taste, the tip of the iceberg regarding personal defense. If we really want to learn, we need to return. There is a discount if we bring more people. I get close to him and ask him where he gets all the money to do this, for the buckets filled with bullets, for the $3,500 Uzis, for the drinks, for the pizzas that we are now eating. This is promotion, he tells me. With the money we get from the paid courses, it is possible to offer free ones, he assures me. I then ask him what he thinks of the walk, a week ago, by a large group of women in Washington, D.C., on Mother's day, to support more restrictions in the use of firearms. He tells me that these are well-intentioned people, but that they are wrong. "In Washington is where there are the most restrictions for arms and it is at the same time the place with the highest crime rate. Removing arms is not the solution. 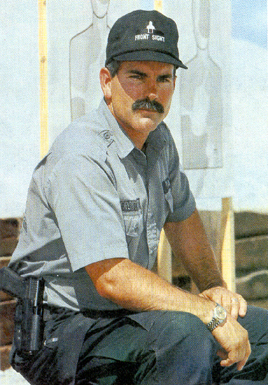 The real solution is educating everyone to use them; that is how you avoid accidents and delinquency ends". -Are you sure of what you are saying? One last thing. How many of the ones who take this free class return to Front Sight? Charlton Heston, President of the National Rifle Association, almost as dedicated as Piazza. The subject of firearms in the United States is not a minor one. Each year, approximately 30,000 people die from armed violence incidents in this country and, according to a survey by The Washington Post, one out of four Americans has been threatened once with a firearm. Pressure comes from everywhere. 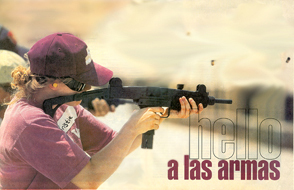 While supporters have walks, like the one on Mother's Day (which had Hilary Clinton's participation), the fire arms supporters ask to leave things the way they are and refer to the Second Amendment of the United States Constitution, where the right to own arms is granted to the population. The most powerful pro-arms entity is the National Rifle Association (NRA), which has just elected actor Charlton Heston as its president for the third year in a row. Conscious of the bad image guns have with the message of Americans, the NRA is trying to change its image, just like Ignatius Piazza mentioned. If the plans get completed, in the next few months the NRA Sport Grill and Store will be opening in Times Square, New York. The grill will offer deer and quails in the menu. The store will also sell hats that will read "less laws and more guns, the objective is for people to lose fear. The NRA's goal is not to lose the battle. Mr. Heston said it, in his re-election: "Firearms will leave my hands, only when they are cold and dead".